I love France so much so I think that one day I may live there. I love the food, I love the wine, I love the countryside each region is different, different wine, different food, different countryside. So what's this to do with Hidden Spain? Well it's like this. Over recent years I've been touring Spain, the countryside and its customs have become more familiar and I'm getting to know and like it well. The Spanish seem to have carried on from where the French left off and enjoy providing a service with a smile. Service stations have pump attendants restaurants have mostly men waiters who are pleased to provide a professional service. I'm not one for long boat trips, I get board, so if we are going to Spain we always choose to take a ride through France why not it's a motorcycling holiday and as I said before I love France so we go for it, enjoying the back roads and sometimes autoroutes. The route from the ferry port at Calais down to Amboise is best forgotten. Over the years the N10 has been improved to in places almost autoroute standard but where it hasn't been up graded it's a chore and uninteresting. However after a night in the comfort of Novotel we were off to greener pastures and a favourite hotel in the Lot Valley. Passing Loches that has close connections with the French writer George Sands who I think was the lover of Chopin and on to join the N940 after Chateauroux. Here the road gets interesting and chance to see how the new parralever front suspension works under load. Reports were good to excellent. Tipping the loaded BM into the tight bends felt positive and secure and when you hit one of those corners which tighten up and, tighten up bit more I felt I could just lean a little bit further with out the fear of the undercarriage dragging along the tarmac. I was really confident. The bike would just roll over the rough sections mid corner with only a tremor from the bars holding the bike on line through the bend. Long sweeping curves were just child's play. The hotel here is in a quiet village Cajarc on the banks of the silent running Lot. Situated in woodland it's was the find of last year. It appears that President Pompidoo moved into the village and in anticipation of an explosion of interest in the village a local business man built the hotel, I suppose to make a quick buck but the President moved out leaving the hotel high and dry. You just can't trust politicians can you? It was our gain though and a gem of a location. The restaurant is something special. Be prepared to eat duck in one form or another often dressed to look like something else but rest assured it will be delicious but it will be duck. The wine from this region is some of the oldest in France and was known back in the Roman days. It has a deep crimson colour and is almost black when young. The service here was as it should have been, excellent. There was no time to explore the famous Pech-Merle caves from which European man stumbled 10,000 years before or marvel at the wonderful Pont Valentre the fortified bridge over the Lot. Built in about 1328 during the Hundred Years War, we were off to sunny Spain but not before we had paid our respects to d'Artagnan a statue in the town is a reminder that someone really existed before Alexander Dumas made him larger than life in the Three Musketeers. Further south the plain of Gascony rises into the Pyrenees and we start climbing. Rolling green pastureland gave way to sinuous mountain hairpins where all the agility and torque from the 150hp engine was called up. Second gear corners came thick and fast on the really tight ones I reached for first. The motor pulled vigorously in each gear and I had to restrain from grabbing clumsy hand fulls of the feather light throttle. We entered Spain through the Tunnel Biesla, one of the oldest tunnels through the Pyrenees leading into Aragon, the bike pulled sixth gear up the long haul, and it's got so much torque. I needed good engine braking for the down hill stretch in on the Spanish side. The road follows the tumbling river through the Ordesa National Park to Biescas through the spectacular Ara Valley. The corniche road climbs to Broto, it's as good as it gets, and rocky escarpments blend with lush fertile valleys. According to figures released by the Spanish tourist office Aragon receives the least number of British visitors of all the Spanish regions don't forget that the first wife of Henry V111 Catherine came from there and she never lost her head at least not over the wonderful views at least. The N240 follows the Rio Aragon past a wonderful azure blue reservoir on the left and some pretty strange rock formations to the right. The road follows the contours of the landscape dipping, climbing sometimes though narrow cuttings and other times cresting a peak looking over the glistening reservoir. Our hotel on the N240 Sansebastian road was situated at the end of the huge Pamplona ring road that seemed to go on forever. We followed the route back from Pamplona towards Jaca turning off the N240 to Sanguesa back into Aragon. Sure the roads were empty just an occasional truck loaded with pigs. The long straight ribbons of tarmac of the A127 stretched far into the horizon, rice paddy fields line the road - I suppose its grown for the paella if its not rice fields its pig farms the region must be the pig capital of the world. Amazingly the pigs attract vultures. Flocks of these huge ugly birds perch on the roofs of the pigpens waiting for scraps. I wondered why it was necessary for the bike to have six gears, at times I found myself cruising in fifth then realizing that I've another to go. Now I know why. On these long straight open stretches snicking it into top drops the revs and up goes the mpg. Mileage on that leg was 220 and on those Spanish roads was no problem on the BMW grand tourisimo it's like an express train TGV. 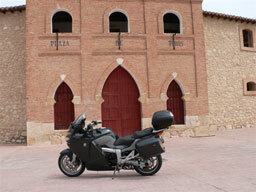 It was our first visit the Teruel Parador and even those with a Garmin didn't find it easy. It's not a particularly interesting Parador but set in peaceful manicured gardens just off the main Valencia/ Zaragoza highway. The town has a big Moorish influence with five Mudejar Towers but for us the prison located almost next to the Parador held our interest as trustees worked in the allotment under the watchful eye of Mr McKay. With a 400 mile stage facing us the day after we decided to shorten the route to El Burgo de Osma and take an easy day to what I consider to be the jewel of Castilla y Leon. Standing on a hilltop in the distance is the old city of Osma overlooking the 18c new town El Burgo. 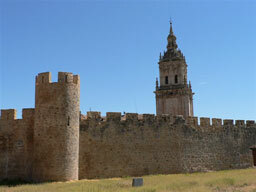 Pass too quickly on the N122 road to Soria and you will miss what is hiding behind the façade of newish buildings. The medieval colonnaded square is an oasis and just the place to relax mid afternoon with a cool beer. Built around the square are wonderfully restored ornate buildings the centre piece being the Gothic Cathedral whose tower stands 64mts it's the third in a long line of towers, the others kept falling down. Using mostly main roads we split the stage up into four legs and disciplined ourselves to about 100 mile stops - petrol, drinks and other things at each stop, we made an early start as well. The long legs of the GT made the run easy, comfort was great Gloria found that with the screen fully up reduced any buffeting to a minimum and for me the cruise control facility proved its worth. Cruising effortlessly at around ninety the bike was showing a good 57mpg. Wind noise from our new Givi helmets was only slight making conversation between us comfortable through our Autocom system, altogether a good package. Arrival at the Baiona Paradore was a regal affair passing through a majestic gateway leading to narrow bends as you pass through emblazoned stone arches before finally reaching the battlements of this stately Galician manor. Our parking place had been coned off for us although we had to share it a Vintage Bentley Rally of sixteen imperial vehicles. No problem we all shared the same passion for travel and all had our own tales to tell. This Paradore ticked all the right boxes. Location, quality, service and restaurant. Breakfasts itself was a feast, everything from a Manx kipper to a boiled egg. Evening meals started late at 21.00hrs (normal for Spain) but it didn't matter. We sat and enjoyed a glass of white wine and gazed at the view, which stretched far out into the Atlantic Ocean. The menus read something like this. Café, wine and water all included both nights. It was time to leave the opulence of this gracious Parador and head northeast. For us negotiating Ourense tested our patients to the limit finishing up travelling the same stretch of the ring road and crossing the River Mino several times before finding our road out to continue our 285 mile day to the Picos de Europa. Our route took us into Principality of Asturias, often called the Spanish Wales because of its coal mining heritage and wonderful coast lines. Its well known for its cider which I must say is an acquired taste. The ritual of pouring from a bottle at arms length into a glass can be a messy affair and hardly worth getting your shirt wet for. Asturian ecologists have saved the Picos as an unspoilt National Park with very strict controls of development. The mountains are known not so much as mountains but for sheer beauty and rugged grandeur. Leading from Cangas de Onis we took the dead end road to our base hotel Covadonga one of the most famous locations in Spain. The view from our bedroom window overlooked the famous shrine to the legendary King Pelayo, who back in 718 took on the Moors and defeating them in the mountain glen, founding the first Christian kingdom in Spain. 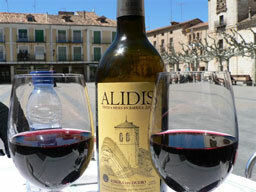 Our tour of Hidden Spain was fast coming to a close. The final leg was back to Pamplona another 260 miles. 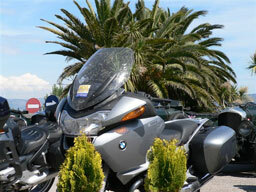 Up to this stage we had covered 2452 miles on the K1200GT which out performed and satisfied every need. 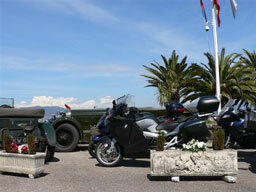 It carried us in fine style through some parts of Spain which are not normally visited by to regular tourists. We confirmed that Spain too has its special regional food, famous wine regions and roads that were just built for motorcycling. However one thing is for sure I couldn't live there. Why? It's too bloody hot.